When the AppStore was a new thing that Apple created from scratch, and was the only game in town 30% did not seem unreasonable. There are lots of options now, lots of app stores, albeit not for iOS. 30% does seem a bit high now. However, while I think the 30% for apps could be debated, I've never understood the 30% for subscriptions. The AppStore hosted the app, it has nothing to do with Spotify's servers or Microsoft's Office365 servers. I've always been uncomfortable with Apple getting a cut of an external subscription service revenue just because they hosted the app. The Apple hating doomsayers had to think of something else to knock as AAPL is rising. They can't allow that. Long as App owners make good money on IOS, they may complain but better to make good money than none. They can of course jail break if they choose. Also if you buy a TV or subscription to cable you can only download from their source. As long as there are options to buy another product all together and not to mention one that sells far more units for cheap, Android, Apple can not have a monopoly. Ironically, Apple’s 30% cut is far less than the 70% charged by carriers to access their networks before the App Store was introduced. How soon they for get. Companies like Netflix are swine. If they were not depending on Apple’s marketing, support, acceptance, ease of use and draw of its platform to grow their subscriber base they would not have activated subscriptions on the store in the first place. They wanted to use Apple’s ease of use and earned trust including their 300,000,000 credit cards on file for purchases thru their Apple ID. Netflix like Spotify would not have grown their paying subscribers as quickly if the customers had to enter their card info to yet another company. I personally won’t do it and don’t believe I’m alone in that. I think it also stems to the ease of canceling through Apple instead of direct. The other issue is marketing. They chose to use Apple because to market themselves was too costly, but they always had the option of signing them on their own site then having them download the app. It just that far fewer people were visiting their sight than searching on the App Store. The App Store is like a high-end mall, with standards and safety for the merchants and the consumers. There are fees and regulations. Regarding App Store, anyone can jail break and lose all their protections. Anyone can go Android. But the most important thing is the the amount of business done through Apps where Apple has no cut is more than 10x the App Revenue - ride sharing, nearly all fintech, travel sites, etc. Calling App Store a monopoly is a tough case. People keep touting the video streaming service, but that looks like a flop before it's even started. They lack any compelling IP's. This isn't like Apple Music where you have the same content as everyone else. In the the streaming market content is king and Apple has none. You obviously haven't been paying attention. Every week AI posts multiple articles about producers, directors, show runners, etc. who have inked deals with Apple for original content. It's too soon to say that none of that content will be "compelling." And besides, this article is about Apple getting or not getting a share of the revenue from Netflix, not about Apple's own (rumored, future) offering in that space. No, not anyone can jailbreak AFAIK. Apple doesn’t want iOS 12 to be jailbroken. In fact, Apple doesn’t want iOS jailbroken period no matter the version, and does everything in their power to make sure you cannot. While Apple may or may not have a technical monopoly on iOS apps, saying that jailbreaking is a factor to consider is silly stuff. It's not. Actually App Store is more like a consignment business model, for virtual goods. NOTE many goods and services sales are facilitated by Apps but do NOT result in payment to Apple. I’m quite comfortable with Apple taking a reasonable cut for allowing a developer to use software Apple created on a device Apple created and available to billions of customers in a store Apple created. That’s a fair trade for people who are reaping the benefits of Apple’s considerable risk and investment. That's not exactly the way Apple's Luca Maestri framed it, and his statements to that effect are being used by the opposition IIRC. He says the sale is Apple's, who then shares a portion of it with developers, rather than devs paying Apple. FWIW if Apple were a consignment shop they would claim the entire sale, and record the portion paid out to the consignee as a business expense AFAIK. I don't believe Apple does the same with the App Store accounting-wise but I don't know for certain. If they do then it seems to me it would be proof enough of standing for SCOTUS to allow the lawsuit to proceed. Even if they don't I think that's going to be the decision anyway. That doesn't mean the plaintiffs will win their class-action case tho. The App Store is a big commercial for resellers. Not in the since of a newspaper or radio ad, but instead a frictionless way to get new customers. A couple of clicks and the money starts rolling in. No forms to fill out or CC info to give out. Netflix and others would not be the size they now are without the App Store. It is the way of business to screw over those who helped you grow. Funny, out of the hundreds of thousands of developers out there, I only really hear of a few that complain about Apples 30% take. Where's this "outcry" from the industry about 30% being too much? If the App Store tax was 15% rather than 30% would develops stop complaining? It wouldn't stop the antitrust lawsuit, and that's where the immediate threat to the services model lies. The exodus of big app developers/service providers will be a slow move if it happens at all. Exactly. It only takes a few ungrateful bastards who were previously too happy to use all of Apple’s resources to create and sell their goods. It has everything to do with where people sign up, why they signed up and who manages the subscription. These companies pay nothing to host their App on the Apple store. If they have the marketing pull to sign them up themselves and not have Apple manage this relationship, then they could have always done as they are doing now. If Apple was concerned about that the free App option would not exist. So, bring your own customers for free or uses our customer base and we manage the subscription and share revenue. I fail to see the issue. Also, if the service provided under the subscription is good enough to maintain the relationship for a year the cut goes down to 15% as the initial acquisition cost which I’m sure factors in the App Store advertising budget has been adequately recouped. So, it’s not because the host the App. It’s because the App is leveraging their platform and consumer trust and goodwill to get them to signup and stay signed up. For instance I would never give my credit card info to Microsoft, Google, Netflix or any company who could be easily bought and policies highjacked by the new company. The request for my credit card usually ends with me hitting the cancel button. These companies knew this and used Apple to have access to their customers during their growth phase. Now that they have a significant base of their own, they want to cry foul. That to me is foul. This is a completely misleading, and meme-supporting, title. There is zero proof that AAPL is “threatened” by this presumed “growing backlash”. It makes about as much sense as taking Apple to court for charging such a high price for it’s products! This is someone’s opinion, and it sbould be identified as such in the title - unless Appleinsider has at last succumbed to it’s industry’s proclivity for click-bait, which I sincerely hope is not the case. John Gruber chatted about this with Ben Thompson on his latest podcast. They both agreed that it was ridiculous for Apple to be taking a cut of others digital content sales. Ben referred to it was rent seeking; Apple taking the cut just because they can. 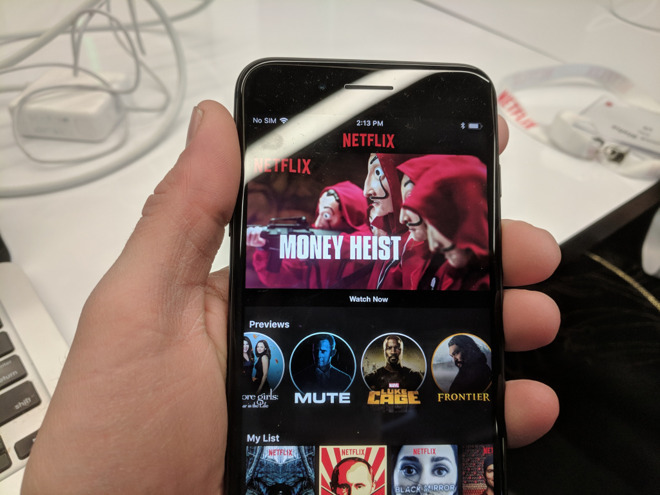 They also agreed that it’s poor user experience that Apple doesn’t let an app like Netflix at the very minimum tell you where to go to sign up or better yet offer a link in app to redirect to Safari or a web view where you can sign up. And as I’ve said before if Apple deserves a cut of Netflix subscriptions (I don’t think they do) then they sure as hell deserve a cut of every Lyft or Uber transaction.